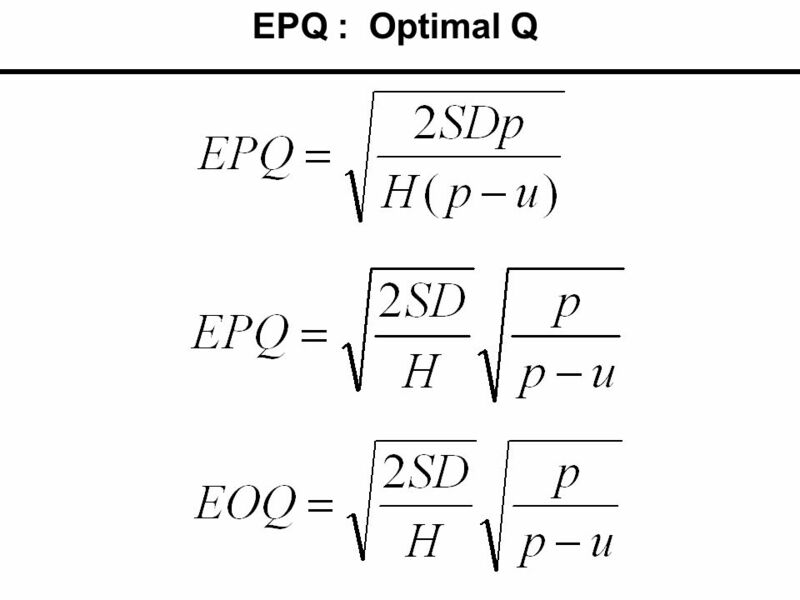 EOQ for Production not Order (EPQ) We do not buy the product. We produce it. 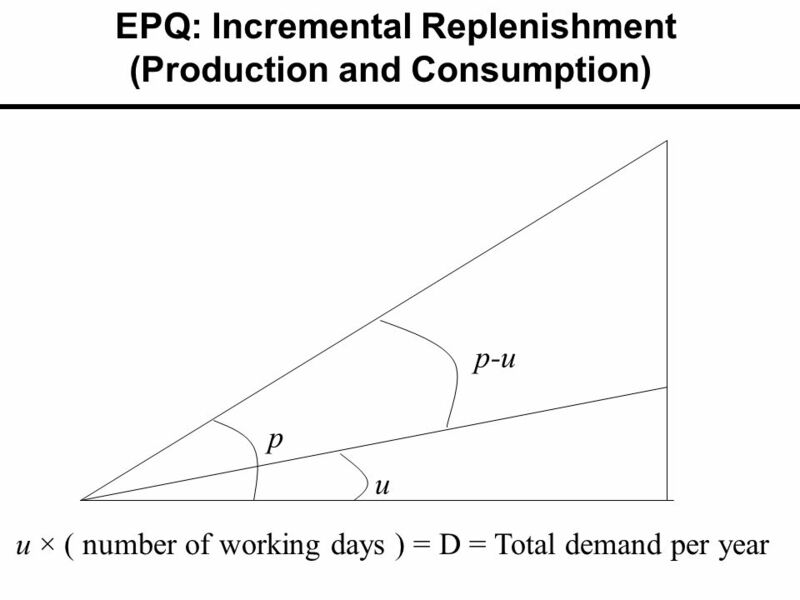 Total demand / year is D Demand / day or consumption rate is u Production. 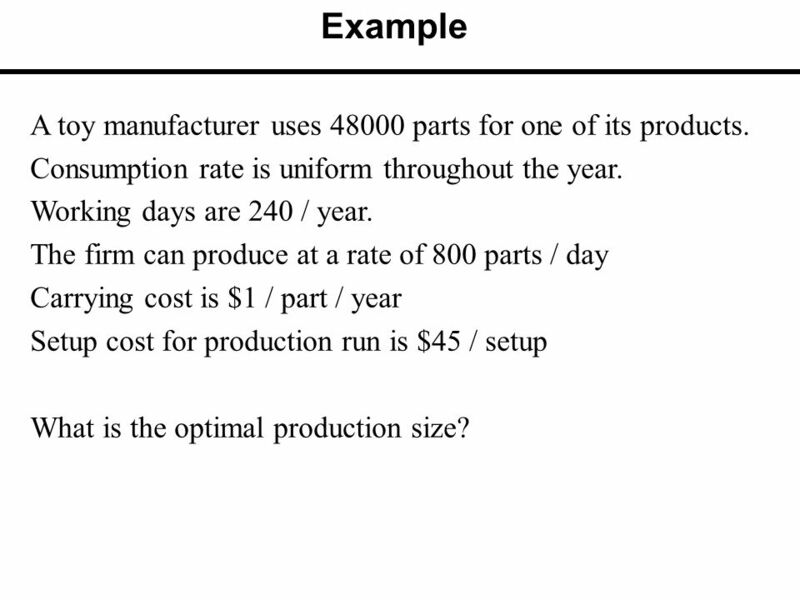 2 Example A toy manufacturer uses 48000 parts for one of its products. Consumption rate is uniform throughout the year. Working days are 240 / year. 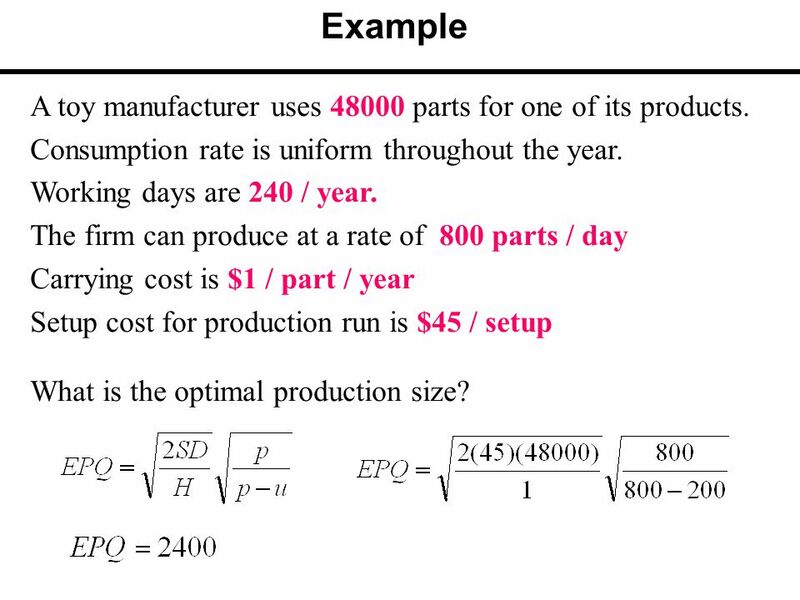 The firm can produce at a rate of 800 parts / day Carrying cost is $1 / part / year Setup cost for production run is $45 / setup What is the optimal production size? 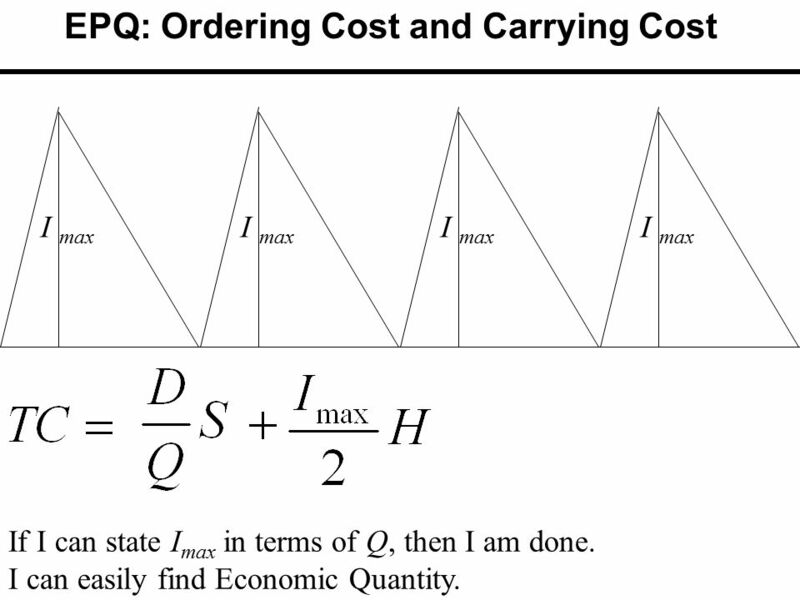 7 EPQ: Ordering Cost and Carrying Cost I max If I can state I max in terms of Q, then I am done. 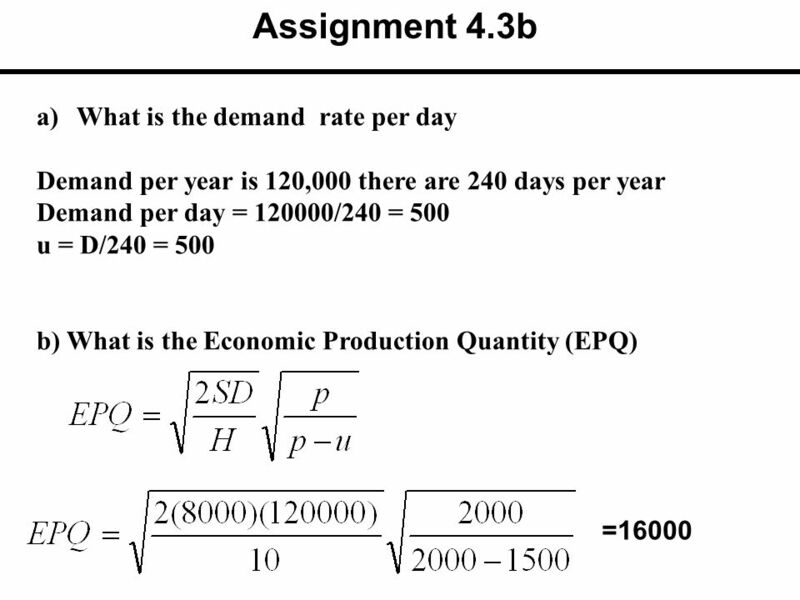 I can easily find Economic Quantity. 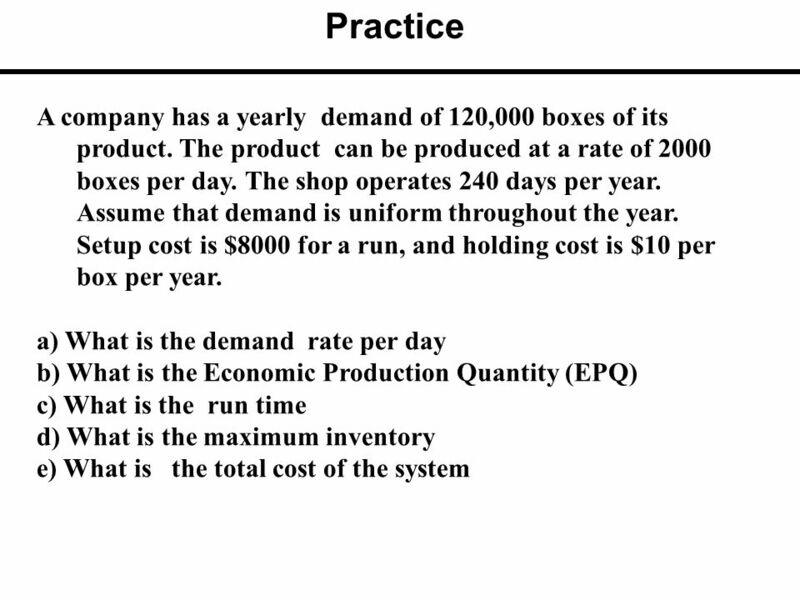 10 Example A toy manufacturer uses 48000 parts for one of its products. 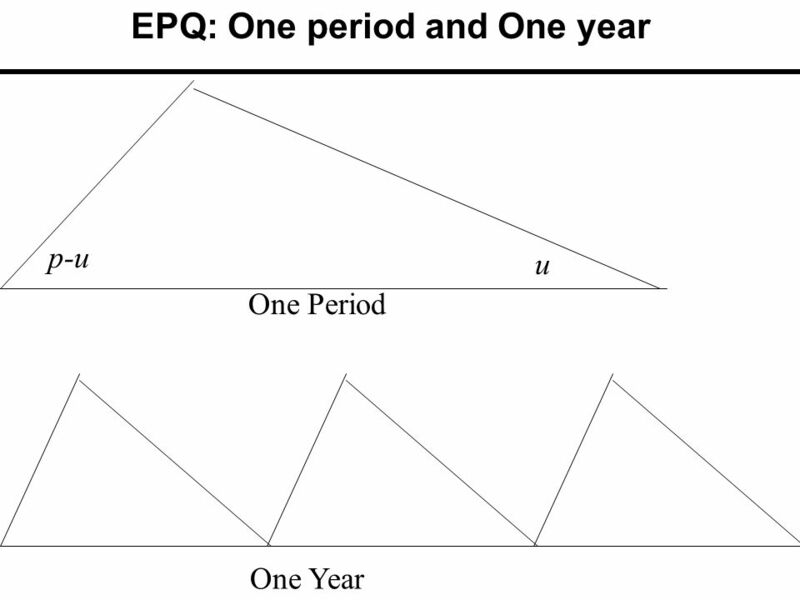 Consumption rate is uniform throughout the year. Working days are 240 / year. 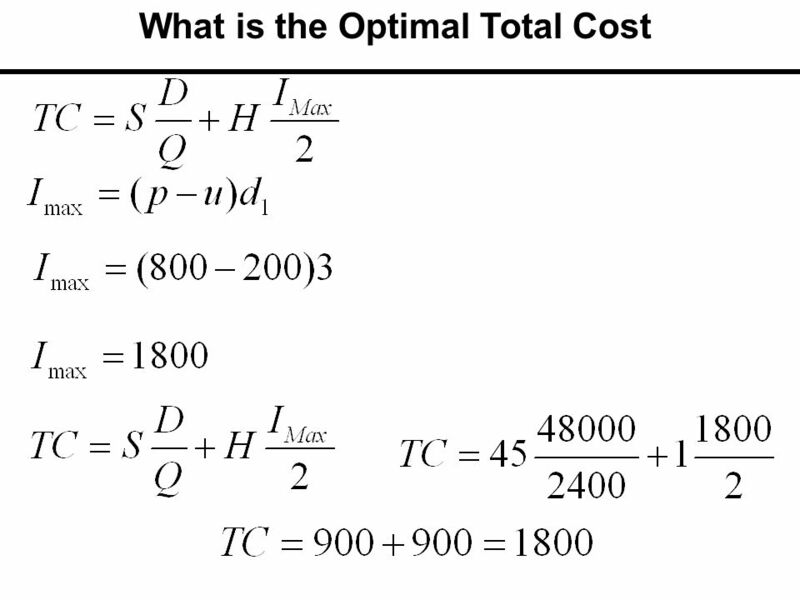 The firm can produce at a rate of 800 parts / day Carrying cost is $1 / part / year Setup cost for production run is $45 / setup What is the optimal production size? 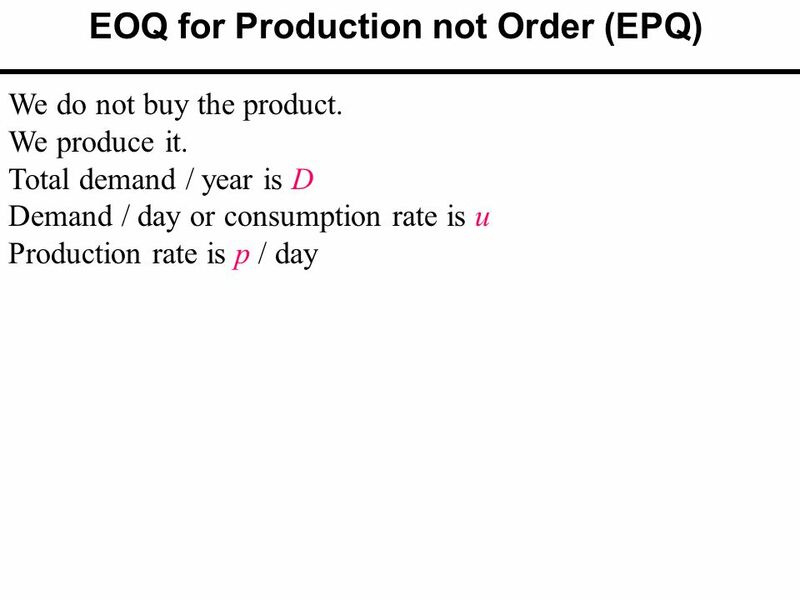 Download ppt "EOQ for Production not Order (EPQ) We do not buy the product. We produce it. 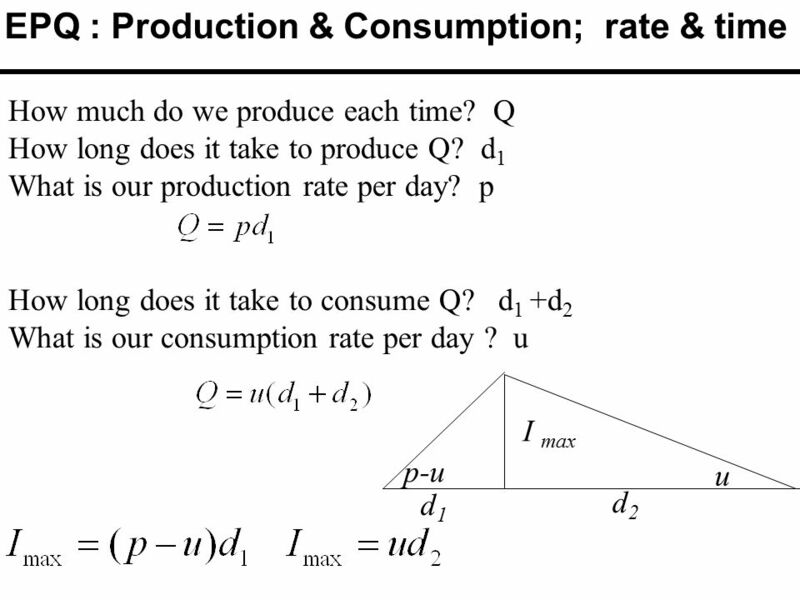 Total demand / year is D Demand / day or consumption rate is u Production." 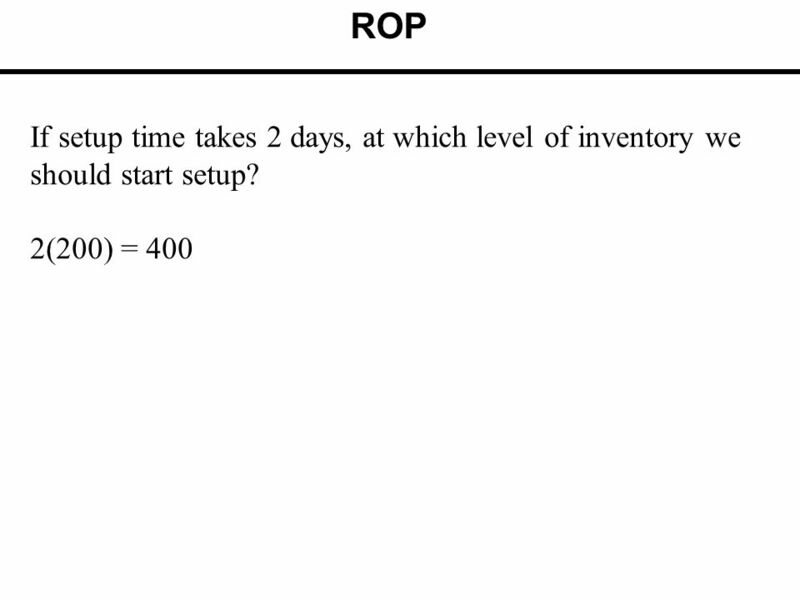 What is Inventory? Definition--The stock of any item or resource used in an organization Raw materials Finished products Component parts Supplies Work. 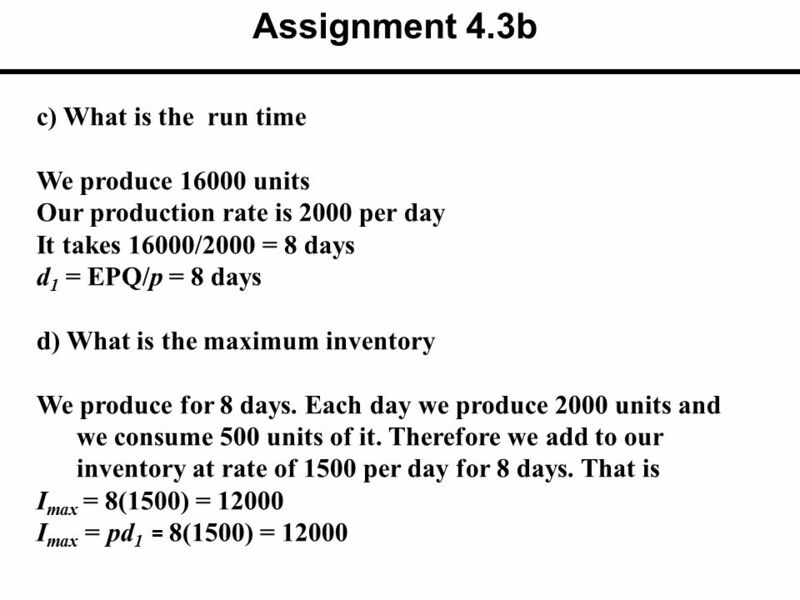 BA 301 Operations Management Spring 2003 Inventory Management Chapter 12. 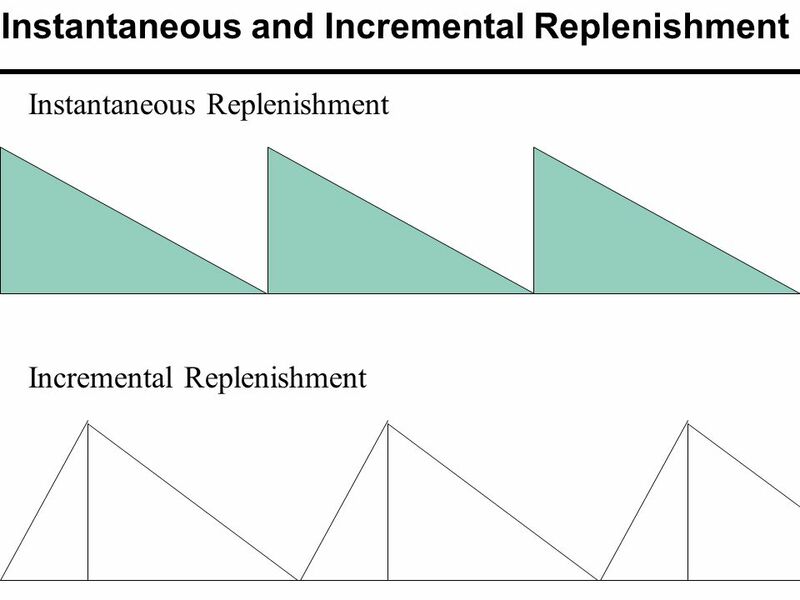 Slides prepared by JOHN LOUCKS St. Edward’s University. 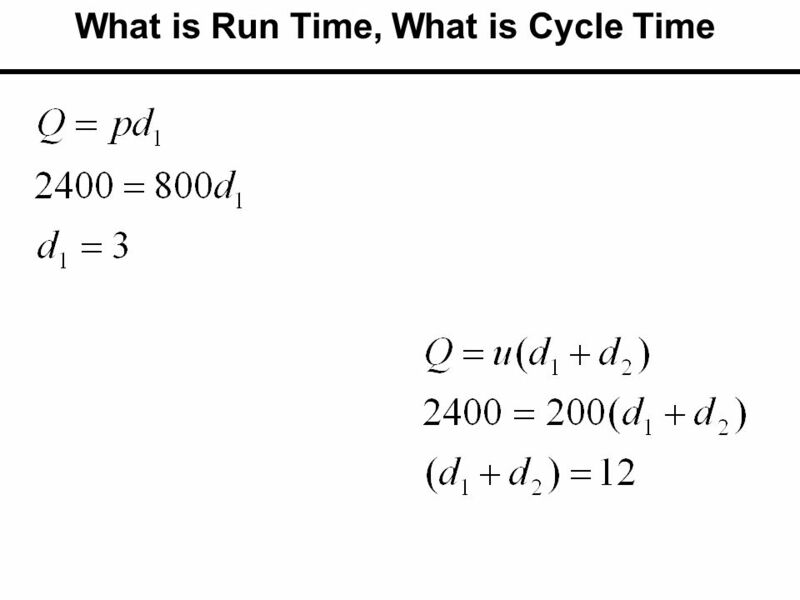 § 2.6 Further Optimization Problems. 1 1 Slide © 2008 Thomson South-Western. All Rights Reserved Slides by JOHN LOUCKS St. Edwards University. 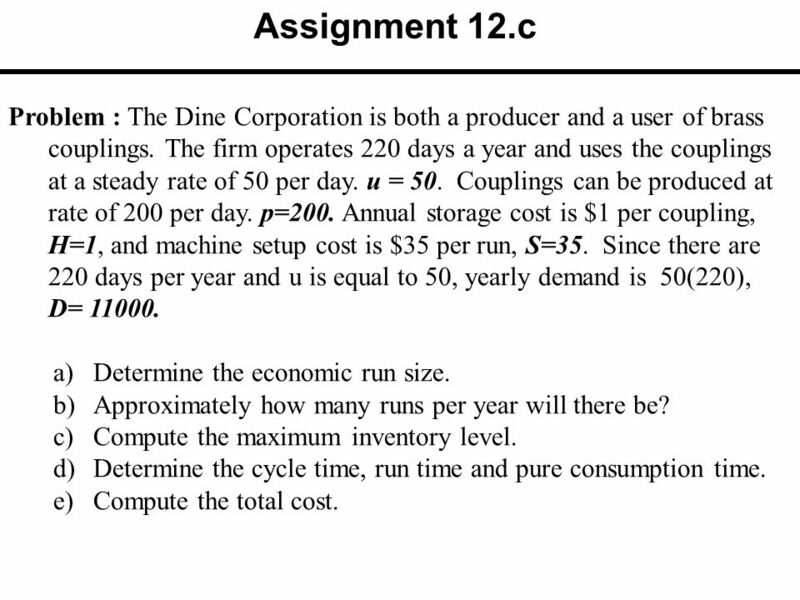 Assignment Ch12a.1 Problem 1: A toy manufacturer uses approximately silicon chips annually. 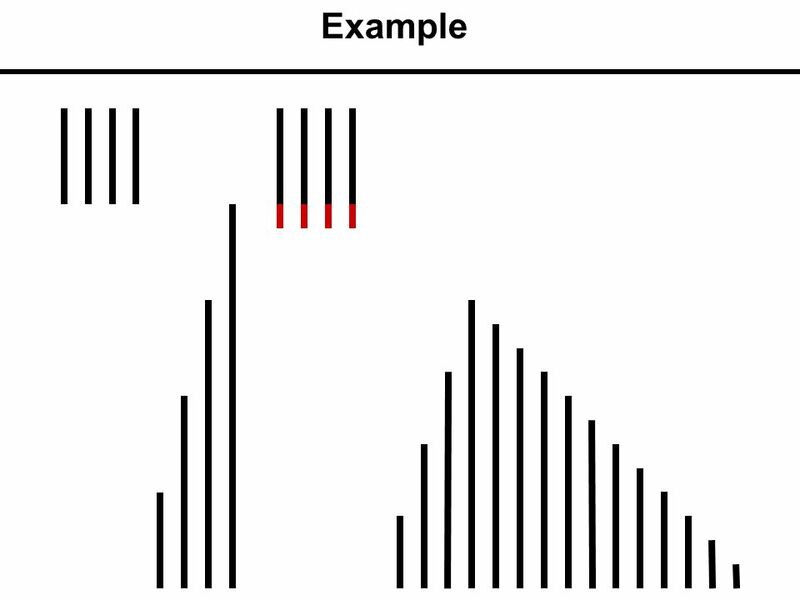 The Chips are used at a steady rate during the 240 days. 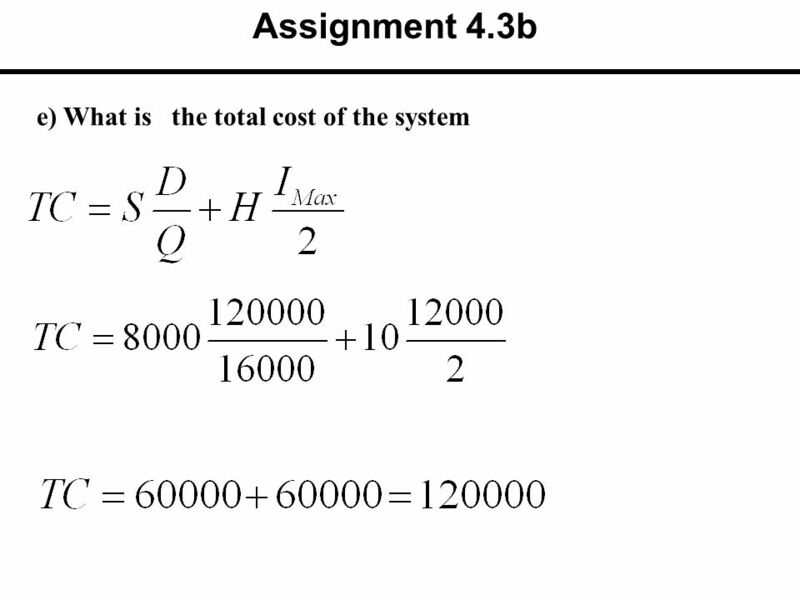 Further Business Applications Lesson 6.3. Economic Lot Size A manufacturer can produce its product in varying batch sizes 120 once a year 60 twice a year. Copyright © Cengage Learning. All rights reserved. OPTIMIZING LOT SIZE AND HARVEST SIZE 3.5.